Happy Friday everyone! Today's post is the start of several in a personal project that I started to feature some of the awesome girl bosses I have in my life! These women do it all: they are entrepreneurs, artists, mothers, inspirational leaders... while encouraging other women around them to be the best they can be. It is said that if you want to know who someone is, look at who they surround themselves with, and I absolutely believe that I am a better business owner, friend, and overall human because of the women you'll see featured here. 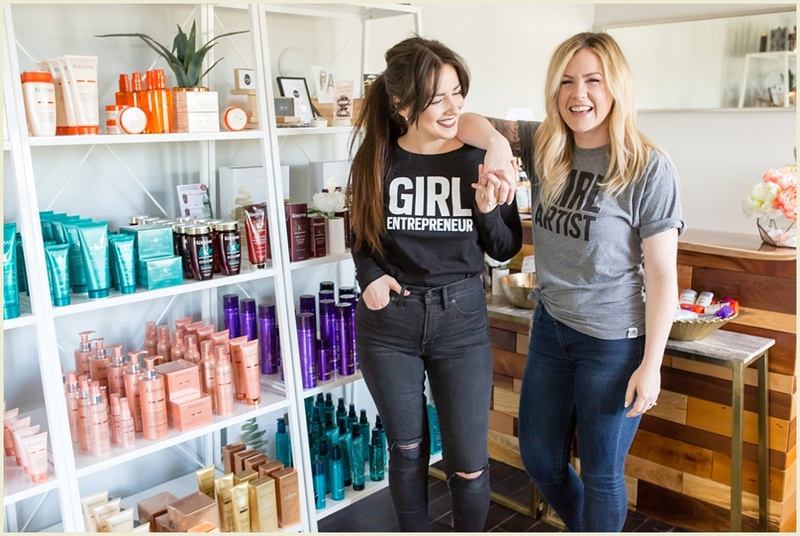 Today I'm kicking off the series with two of my favorite people - Holly and Kayla from the amazing Tru Salon in Coralville, Iowa. These women are truly some of the most creative, inspiring, and encouraging people I've had the pleasure of knowing. Holly is an incredible hairstylist, but also a great boss babe building her empire while encouraging her team to reach their highest potential. Kayla is one of those women that has talent oozing out of her, she's an artist, hairstylist, makeup artist...this girl can do it all. On top of all of their top notch business skills, these ladies are also incredible mothers, and amazing friends. If you haven't had the pleasure of visiting Tru Salon, you must check it out. 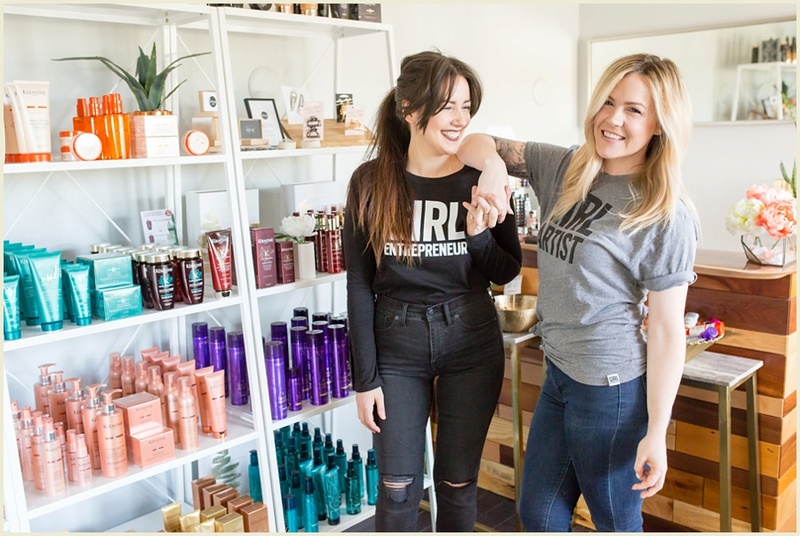 So, here are the girl bosses of Tru Salon..I asked everyone the same questions in these posts, so hopefully you will get a feel for how they made their business dreams a reality! I hope that you are as inspired by all of these ladies as I am! Holly: My inspiration began with wanting to provide an exceptional experience for my guests while making them shine from the inside out! As we’ve grown my inspiration also comes from growing leaders and providing careers for motivated, driven individuals. I love helping dreams come true! Kayla: While I only recently became an owner, I have worked in the salon industry for many years and love the opportunity to connect with guests as well as coworkers! As an owner I am looking forward to helping young girls establish careers for themselves as well as strengthen themselves as individuals. What advice would you give to future female entrepreneurs? Holly: Surround yourself with people who are smarter than you. As my mentor told me, if you are the smartest person at the table, you are sitting at the wrong table! Kayla: Think positively and understand that mistakes are strictly learning opportunities! Your team deserves a positive attitude and outlook on the future! Holly: I’m never to proud to ask for help and/or advice! Kayla: I decided to never get complacent. It’s easier to let someone else take all the risk, but no reward comes from that! Holly: Learning that we are not the right salon home for everyone and that’s ok! That was an important lesson. You must learn what type of person will succeed in your business and only hire them. It is not only the best thing you can do for yourself, but for them too! Kayla: Becoming a leader comes with many responsibilities and one of them is learning to lead by example, pull the rope, don’t push. Team members are much more encouraged to change their attitude or habits when you are working right alongside them setting the standard. Something I think men and woman both struggle with is balance! What are your tips for balancing career and family/personal life? Holly: There has to be a balance. If you ignore one area they both hurt. If you put effort and love into both then they both flourish. It’s interesting, but I’ve found the more time I devote to connecting with my fiancé, the more I’m able to give in my career. Kayla: Make it happen! It’s so important, if you don’t spend time on yourself or your personal life, it will suffer..requiring more attention in the end. Dave Ramsy says, if you don’t have time to exercise now, how will you have time for triple bypass surgery? Holly: My first thought is all of the relationships I’ve developed. There is so much love! Secondly, the strength and confidence it has given me is priceless. We are all capable of more than we can imagine and that is so empowering! Holly: I see multiple Tru locations filled with passionate and empowering individuals going after their dreams while lifting up everyone around them! Kayla: Multiple locations and a gang of fierce hairstylists chasing their dreams!